With upcoming elections in May, the Iraqi government is urging Internally Displaced People (IDPs) to return home. After the defeat of ISIS in December 2017, an increase in security and number of returnees to their region of origin is expected; however, many IDPs see no way to leave the camps just yet. While two million people have returned to their homes, three million people farther remain displaced. The eruption of ISIS in January 2014 and the following years of violence have led to a humanitarian disaster; on top of that, the number of IDPs displaced between 2006 and 2007 is still at approximately one million. Nearly 9 million Iraqis require humanitarian assistance of which 5 million are in critical need of safe drinking water, according to the World Health Organization (WHO). 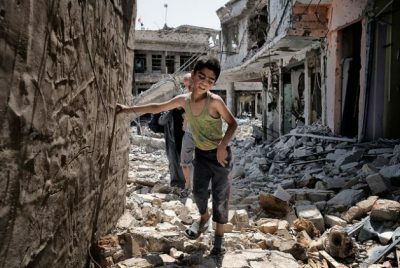 A drastic reduction in armed conflict is anticipated for this year, however, the complex pattern of second displacements may continue to occur even though Iraq expects an increase in returns, according to UNICEF’s Humanitarian Action for Children Report. “There is an impetus for people to return to their area of origin ahead of elections in May,” Melany Markham, media coordinator for the Norwegian Refugee Council, told IPS. The May elections were originally scheduled for September 2017, but were delayed by six months due to the Iraqi civil war. The Muttahidoon, the Uniters for Reform Coalition and Iraq’s largest Sunni political alliance, called for a further six months’ delay to allow enough time for IDP voters to return home, however, Iraq’s Supreme Court ruled a second delay unconstitutional. In camps east of Mosul, the numbers of arrivals after their second or even third displacement now surpass the number of departures of returnees. “We cannot go back to Mosul without guarantees and international guarantees to be safe and to be some people to protect us,” an unidentified IDP told NPR correspondent Jane Arraf. A similar development can be witnessed in Anbar Province. “At least one in five of the displaced people who left the Kilo 18 camp in Anbar Province in December returned back to the camp because they couldn’t go home. Sometimes it’s an issue of safety and sometimes they return because their homes have been destroyed or they are occupied by others,” said Melany Markham. On April 3, Iraq’s Ministry of Justice published the country’s 2018 federal budget. After voting in favor of the $88 billion draft on March 3, President Fuad Masum ordered to publicly share the document after previous weeks of dispute over the reduction of Iraq’s Kurdish region’s share from 17 percent to 12 percent. The tense relations between Baghdad and the regional government in Erbil worsened after Kurdistan’s September referendum with 93 percent overwhelmingly endorsing the secession from Iraq. The budget cuts will affect the region around Erbil and Mosul, where ISIS caused a tremendous devastation and a surge of refugees. In retaliation, Iraqi forces closed Erbil International Airport, took disputed territories, including the oil-rich city of Kirkuk, from Kurdish control, and shut down border crossings with Iraq’s neighboring countries. At Baghdad’s request, Iran closed seven unofficial border crossings with Kurdistan in support of the measures taken to isolate the Kurdish region. The effects of Iraq’s political and financial crisis in retaken areas like Erbil and Mosul impact the establishment of a stable, safe environment for IDPs to return to. About $30 billion were pledged for the rebuilding of infrastructure at a recent reconstruction conference in Kuwait. Yet, the World Bank estimated that a total $88 billion dollars of damage has been caused. Outside of refugee camps, Iraq’s public services such as water networks and health systems, essential but costly, remain overburdened in the war-affected regions, struggling to provide service to returnees. It will take time to restore Iraq’s infrastructure.